As orthodontists, it’s easy to feel like we practice on islands, but it is critical for us as specialists to work with other oral care professionals when it comes to the best interests of our patients and their orthodontic and long-term dental goals. To address the changing aesthetic needs of our patients, interdisciplinary collaborations have become a necessity. As such, we must establish an open line of communication from the very beginning—and keep that line of dialogue open as modifications (if any) need to be made to the overall treatment plan. Restorative treatment is often a combination of oral function and smile aesthetics, both during treatment and upon case completion. Clear aligners can provide an aesthetic treatment solution for implants, crowns and other restorative dentistry needs, without sacrificing the control needed to resolve spacing issues. Fig. 2: Initial radiographic imaging. Fig. 3: Initial maxillary (left) and mandibular views. Fig. 4: Four months into treatment. 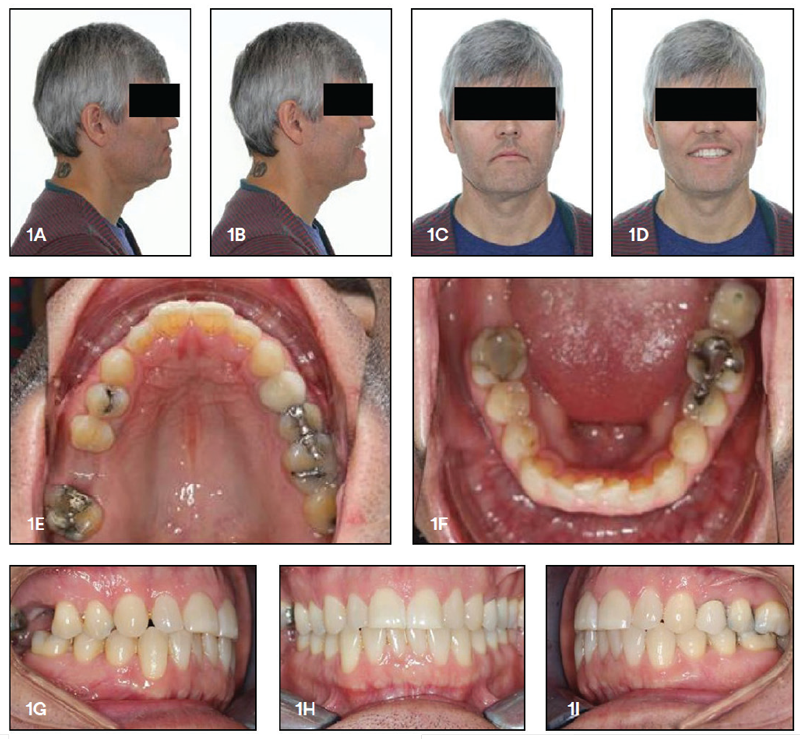 We had a 45-year-old male patient approach us with the desire to improve his alignment, close a few small spaces (between UR2 and UR3) and prepare for dental implants in the UR6 and LR7 areas (Fig. 1). The patient’s chief complaints were crowding and minor spacing. He also had a Class I malocclusion with moderate lower crowding and mild upper crowding (U&L, 3x3), along with a need for improved arch development and coordination (Figs. 2 and 3). When he first walked into the practice, the patient was scheduled to receive two implants in three months, and he had existing crowns placed on the LL7 and UL4. Seeking a comprehensive treatment plan for his implants and alignment, the patient expressed interest in an aesthetic corrective solution. Given the choice of brackets or clear aligners, he decided on aligners, purely for their aesthetic qualities. Following our initial consultation, I called the patient’s dentist, with whom I had worked on other previous cases, to formulate the treatment plan. Fig. 5: Six months into treatment. Fig. 6: Maxillary (left) and mandibular occlusal views, six months into treatment during first refinement. Fig. 7: Final visit, 10 months after starting treatment. The patient’s dentist and I both knew the importance of delivering confidence and aesthetics to the patient throughout treatment. As such, we decided to utilize 3M Clarity Aligners to develop the patient’s upper and lower arch, align his upper and lower teeth and stabilize his bite. 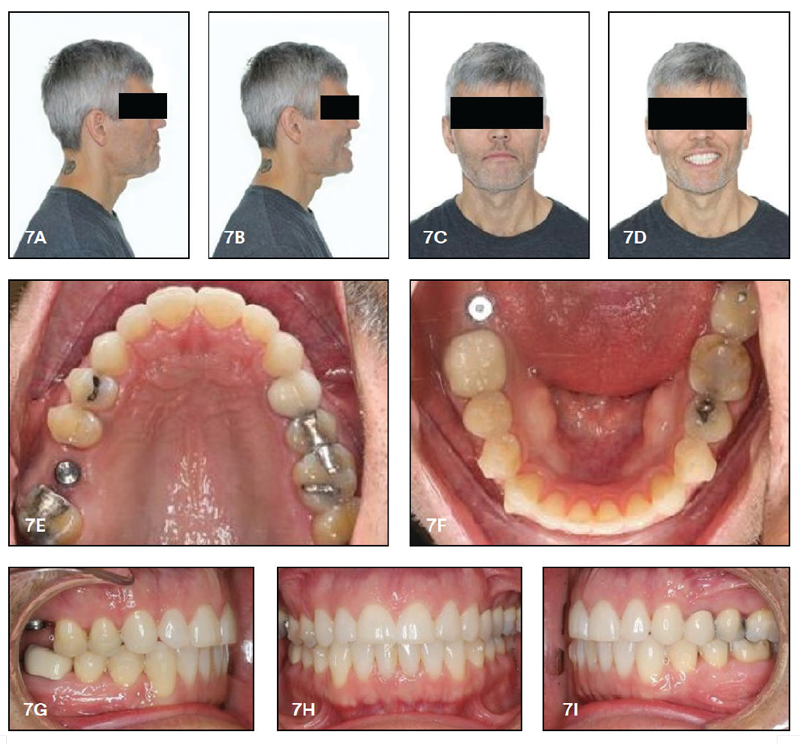 We also created the treatment plan based on the knowledge that he would be getting implants: We maintained spaces for the future implants by using programmed space maintenance in the UR6 and LR7 areas, and minor tooth uprighting programmed into the aligners on the teeth that were directly adjacent to these spaces. When communicating the plan to the patient, we explained that the treatment schedule was only an estimate, because each person’s teeth move at different rates and they experience different levels of comfort with treatment. Fortunately, in this case, we were able to follow the planned treatment timeline because of great tracking with the aligners. At initial delivery, we added seven attachments using Transbond Plus Self Etching Primer, Transbond LR Light Cure Adhesive and the Clarity Aligner Attachment Template. These included bevels on UR5, UR4, UL5, UL4, LR4 and LL4, and one bar on LR3. 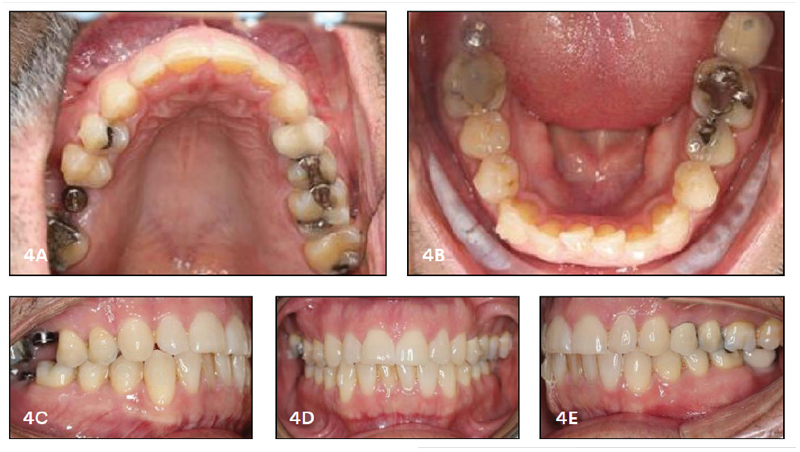 We then gave the patient 13 aligner trays to be used over the course of the next few months (Fig. 4, pg. 37). Once the implants were placed, we trimmed the tray slightly to make sure that it wasn’t placing any pressure on the implant. Otherwise, we didn’t need to make any further adjustments with the aligners. 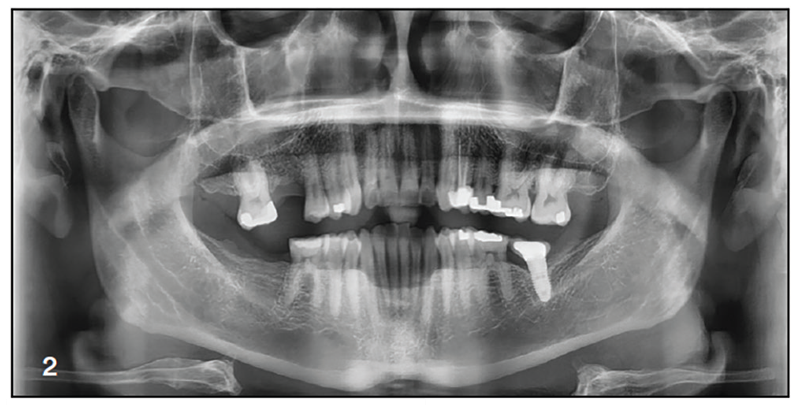 After the attachments were initially bonded and the 13 weeks of trays were completed, we performed a refinement scan using the 3Shape Trios Intraoral Scanner and delivered eight final aligner trays to finish and detail the case (Figs. 5 and 6). The patient’s final visit took place 10 months after the initial consult (Fig. 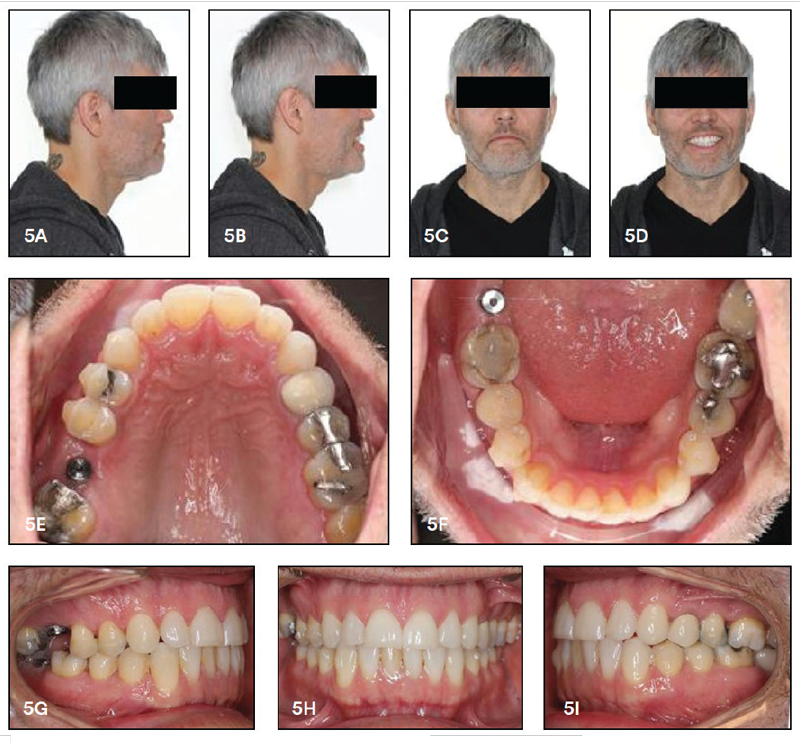 7), where he received crowns on top of the implants, following completion of the final set of aligner trays. We also fit him with upper and lower clear retainers for retention and stabilization at that last appointment. In total, the patient was in active movement for six months, and we found the treatment to be very predictable. The case tracked nicely, even for minor rotational movements in the anterior, which can sometimes be difficult to control with aligners. The implant placement also worked perfectly with the refinement, meaning that we didn’t need to modify the aligners after the implants were placed. Most importantly, the patient was especially pleased with the aesthetics and overall comfort of the aligners. My first experience using Clarity Aligners with a case of this complexity proved to be seamless. For combined restorative orthodontic treatment, we worked with the patient’s dentist to place the implants after we established the right spacing and setup. Then we continued our treatment with the aligners, maintaining aesthetics throughout treatment, without incurring any complications. Given our positive results, I would feel confident using a similar approach to treat even more complex cases that include implants, crowns or other restorative dentistry needs in the future. 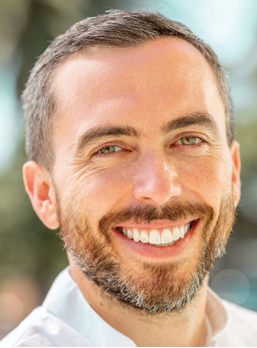 Dr. Ryan McComb graduated from Harvard University in 2010 with a DMD and earned his orthodontic certificate and master’s degree from the University of California, Los Angeles in 2013. McComb, who opened his private practice in the hypercompetitive Los Angeles market, has quickly demonstrated that the opportunity for rapid practice growth exists even in the most saturated markets. He is board-certified and is a lecturer at UCLA. His speaking interests include practice management, team development and marketing. When not in the office, you’ll find McComb mountain biking, surfing, skiing or playing beach volleyball.